CES 2018: HP Z 3D Camera announced, Creates realistic 3D digital images from real objects. HP today announced the launch of the Z 3D Camera. Designed for CG artists, 3D designers, game developers and digital fine artists, the HP Z 3D Camera extends immersive experiences available with the Sprout Pro G2 to an accessory that easily attaches to a computer display to capture and digitize 3D objects, 2D documents and live video. The HP Z 3D Camera's unique design minimizes desktop space for real-time capture and visualization. It creates life-like digital images by rotating an object with the user's hands or positioning under the camera - SLAM (simultaneous localization and mapping) tracking and scanning technology constructs the 3D model in real time. Workflows are enhanced by scanning objects with computer-graphics-friendly resolutions that maintain separate texture maps for physical-based rendering (PBR) and AR, VR and mixed reality content creation. The HP Z 3D Camera allows for richer, more immediate remote live sharing by bringing into view the desk, hands, etc. to complement screen sharing, text and the webcam, ultimately resulting in a more human experience. 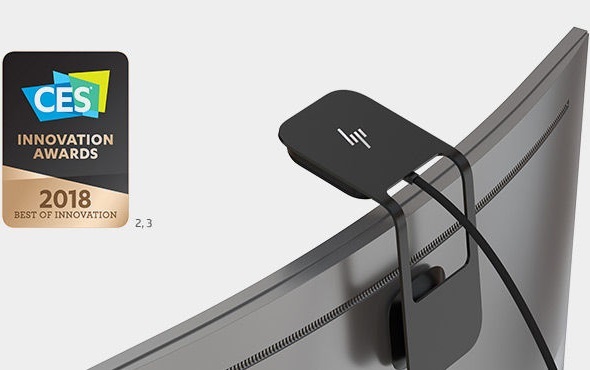 + HP Z 3D Camera brings a zero footprint form factor, users can attach it to the back of a monitor with its magnetic badge. + HP hardware and software innovation allow users to create realistic 3D digital images from real objects. HP scanning technology constructs a 3D model in real time, supplying users with high-resolution images and textures for 3D applications. It also generates document capture for things like OCR for document flow. + Scans objects with computer-graphics-friendly resolutions that maintain separate texture maps for VR/AR/MR applications. The hyper-realistic texture increases the creative palette and speeds up modeling workflows for professional 3D creatives and Windows 10 Creators users. + Share captures or live videos of notes and sketches directly from the desktop. Allowing for richer, more immediate picture-perfect remote Skype or other collaboration tools by bringing into view the desk, hands, etc. to complement screen sharing, text and the webcam, ultimately resulting in a more human experience. HP Z 3D Camera easily exports models to PowerPoint 3D, Paint 3D and Mixed Reality Viewer, making 3D capture available to anybody that is using Windows 10. Additionally, Adobe recently announced its Dimension Tool - a 3D tool for 2D users bringing captures into a 2D workflow to make beautiful images and control things like lighting, scale and texture all within the Adobe Suite. Professional users will relish the power of HP Z 3D Camera when using products like ZBrush, Substance Painter and products from Autodesk. The HP Z 3D Camera is compatible with most of the current HP Z and E series monitors and requires PC with Windows 10, 4th gen Intel Core i7-4709S or higher, 1xUSB-3.0 Type A, 1xUSB-2.0 Type A, minimum 16G RAM and 1.8GB available storage, NVIDIA GeForce GTX 960M or better NVIDIA graphics card required for 3D capture. - Black, shiny, transparent, glossy and highly reflective surfaces have 3D scan limitations and are not recommended. HP Z 3D Camera is scheduled for US-only availability in March for $599. HP Z 3D Camera is not available in all regions.